I have been working on a special Webinar the last 6 months to review all the latest treatments and prevention of Cataracts. There is so much new information that I want to share with you and I want to answer the question: "Can Cataracts be Reversed Without Surgery?" Here is a sample of items covered in the webinar. Can eye drops cure cataracts and what eye drops work the best? Focal scurvy might be a cause of cataracts. Why Cataract surgery might lead to macular degeneration and why this should be your last resort. How to prevent this if you need cataract surgery!! Elevated lead is a leading cause of cataracts. 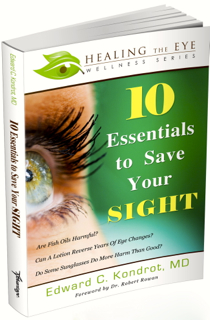 Please join me for this special webinar and receive a free gift a copy of my best selling book, Ten Essentials to Save Your Sight, worth $24.95!